Really excited to see what's possible with these new functions! So here's my first one to test. Hope I've got the protocol correct, never made an image filter in Vuo before. A remake of something I used a lot in Qtz, 'Inspired' by the Trapcode plugin of the same name. It's a bit heavy on my old GPU with HD movies so I wonder how it will fare as a plugin....I expect the same functions will still be heavy? Maybe I should use some kind of scaling before adding the effect...? Nice! Here's an FFGL plugin exported from your composition. I added parameters for blur quality and image scale so you can choose lower quality + lighter GPU load or higher quality + heavier GPU load. Let me know if it works for you. Thanks so much! I played around a bit more and got the blur rotations better, changed the layering and added some contrast to the glows. Hope you can find the time to export this along with your previous changes. I have added the original image back in with Screen blending mode, but seeing as this is selectable within Resolume it's not needed within the Freeframe. Adding rotation control for the blurs would be a nice addition at some point too. Here's the FFGL for your latest version. Thankyou Jaymie. Can't wait to be able to export my own, I'll try and create a bunch of presets, I can see lots of potential tweaks and improvements. I wonder if it will be possible to include a colour picker which works with the Resolume system? Hello again, So I was being a bit dim with my previous comps, still learning the basics everytime I use Vuo. I couldn't find the addition blend mode previously, and now found out how to do the false colour correctly. 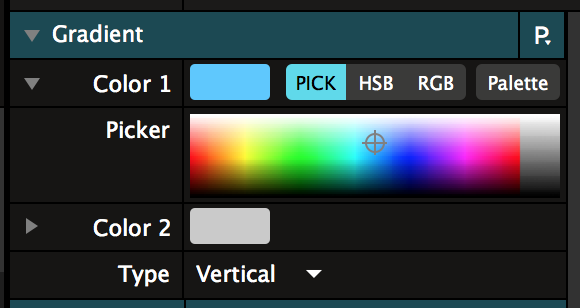 I wonder if it will be possible to include a colour picker which works with the Resolume system? A published input port of type Color in your Vuo composition gets turned into 4 parameters in the FFGL: red, blue, green, alpha. In Resolume, they show up as RGBA sliders. It's not the full color picker interface provided by some (non-FFGL?) Resolume sources/effects. It's about the same as the RGB mode of that interface. OK thanks, it might be better for users if I put a hue rotation into the colours so that there are less sliders to deal with. Thanks again Jaymie. I like the look it produces now. BUT I noticed something very unexpected. If I use it on a movie with an Alpha channel it turns too full on pink. Please can you explain what is happenning there? Same thing when running in Vuo Editor: If you feed it an image with a transparent background, the background of the output image is pink. In your composition, the input image is being composited on top of a red background using multiply blend mode. So, transparent areas will show the background (red), and white areas will multiply the background by 1 (1 * red = red). Same with dark green and dark blue. Then it adds the 3 together. red + dark green + dark blue = pink. To mask out transparent parts of the image, you can use Apply Mask. I need to replace the alpha channel with black..... So I used another Blend Images set to screen mode to replace the transparency with black. Seems to work for me. See attached. I couldn't do it with Apply Mask, as it uses the brightest areas of the image not the transparent unless I was using it wrong? Oh right, Apply Mask masks out areas that are transparent or dark. You figured out a way around it, but for future reference, here's a composition that uses Shadertoy to mask out only the transparent parts. And here is your latest version as FFGL. Nice to see you added the paramater display. :D Thankyou again and happy new year! How to generate UV/Texture coordinates?